Brandon and Lori Whitaker with their children (from left) James, 5; Jovanika, 6; and Avery, 9. 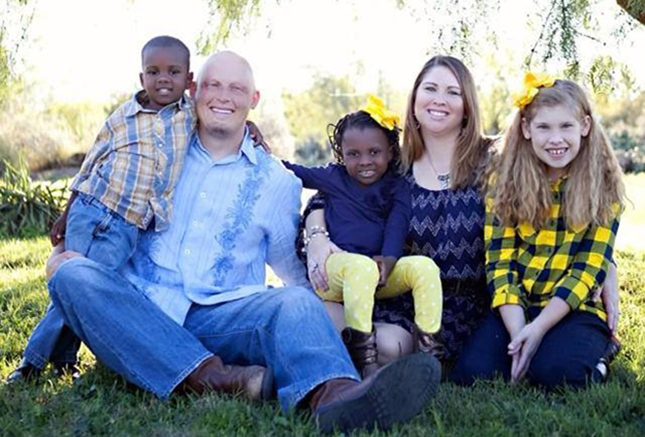 Brandon Whitaker (’96) and his wife, Lori, always knew they wanted to adopt but had never considered an international adoption and had certainly never considered adopting siblings. That all changed when Lori took a missions trip with her church to Haiti. Brandon tells how James and Jovanika joined their family, as we continue our series about Abilene Christian University alumni who have followed their hearts to adopt. Brandon works for the U.S. Securities & Exchange Commission in Fort Worth, and Lori is a first-grade teacher in Arlington. They have one biological daughter, Avery, 9, in addition to their two adopted children. After Avery was born, we wanted another child and tried unsuccessfully for several years to conceive. About this time, the devastating January 2010 earthquake hit Port-Au-Prince, Haiti. Our church had ongoing missions work in Haiti and had planned a trip several months after the earthquake. My wife decided she wanted to go. I could not go because I have a condition that does not allow me to sweat. To take a trip to one of the poorest countries in the heart of the Caribbean, just after what little infrastructure they had was destroyed, would be extremely dangerous for me (I eventually made it over there, though). After Lori’s first visit, she fell in love with the country and the people of Haiti. When she came back, we began to talk about adopting. My wife is adopted, and we always knew we wanted to adopt at some point. This particular option had never really crossed our minds before. But God works in mysterious ways and our plan is not always His plan. My wife decided to go back to Haiti again on another missions trip. At this point, we were a little more serious about adopting but had the mindset that if this is what God wanted, He would show us. We knew we wanted a little girl between 1 and 3 years old, and at that time in Haiti if you applied and were approved, you could actually handpick the child you wished to adopt. So my wife went into that trip with the mindset not necessarily to find our future daughter, but with an open mind and heart willing to listen to God if he spoke. When Lori got home, we talked and prayed about the adoption and decided this was it. She was our girl, and we wanted to bring her home to join our family. We submitted our application and were approved a couple of days later. Shortly after getting approved, though, we got another email from the director of the Creche. The director told us that Jovanika had a little brother, also at the Creche, and that they did not like to separate siblings. Jovanika was new to the Creche and their records, which are not great to begin with, had not been updated when we applied. We were told they would not allow us to adopt Jovanika without adopting her brother also. They understood if we could not do this and would be happy to place us with another girl when one became available. To say this was a curve ball is an understatement! After several more days of prayer, discussion, consultation and a hard look at our finances, we decided that this was God’s plan for our lives – that we had been chosen to be the parents of not just Jovanika but James as well. The rest would work itself out, we felt. And it has! After two years, our adoption was completed in August 2013, and we brought James and Jovi (our nickname for her) home that same month. They have truly been a blessing, and we couldn’t imagine having one without the other. They have adapted extremely well. I think the fact that they had each other when they came home to us helped with their transition. James and Jovi have two other biological siblings, and we know the family that adopted them. They came to visit us this past summer, and occasionally we Facetime or Skype with them. We want to make sure they stay in touch. If you want to read more about the adoption, Lori started a blog in June 2010 called “From Haiti to Home” in which she chronicled the adoption process and her other trips to Haiti. Between three kids and teaching full time, she has not been able to keep the blog up to date. Surprisingly, we don’t have as much free time as we used to!